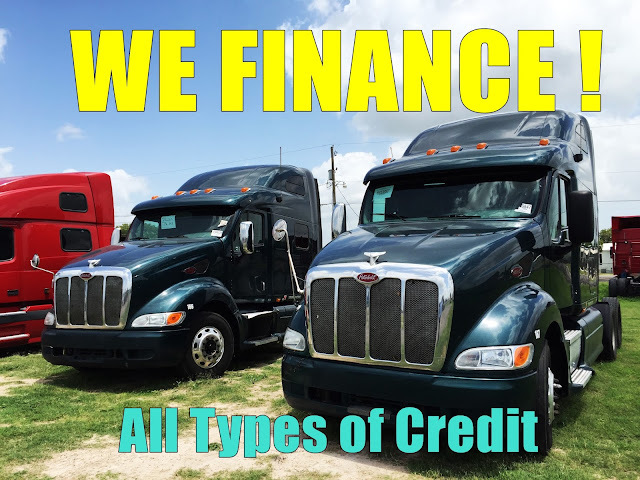 By now youve probably heard that we offer financing for heavy trucks, whether you have good or bad credit. Give us a try. We can handle your credit situation, even if you have Repos, Bankruptcies, or slow pays. We've help alot of truckers and investment first time buyers purchase a truck, with a Low down payment. What we focus on and are looking for is your work history, proof of income, and references. That to us is your credit. We can walk you thru the process of getting a truck, and even guide you to establishing Business credit for your future business purchases. Business credit is fundamental in growing your company when you are ready for more equipment, more trucks, or any commercial endeavor. If you need more trucks fast, we can help you if you've been in our finance program ONLY 3 months. All you need is a down payment of 20%. Do not hesitate and begin the process of being your own boss and increasing your income immediately!